Newman’s Gentleman by Ronald J. Snyder, D.D.S. Evidence of the respect for Blessed John Henry Newman’s unsurpassed 19th century treatise of higher education is his frequently referenced gentleman; who forms “the beau-ideal of the world”. Newman’s gentleman, when taken in isolation, appears as an exemplary product of an educational ideal. In Discourse 8 of The Idea of a University Newman described the gentleman in no less than 812 words; he is refined, gentle, makes others at ease, tender, merciful and “never inflicts pain.” The description is so packed with superlatives that scholars have compared Newman’s gentleman with Aristotle’s “magnanimous man.” A cultivated intellect, a delicate taste, a dispassionate mind and a noble and courteous bearing in the conduct of life are recognized as essential qualities in the make up of an educated gentleman. Newman’s work, however, must always be taken in context. His gentleman is actually limited to the description of the natural man whose highest aspirations hinge solely on the four human virtues of prudence, justice, self-control and courage. 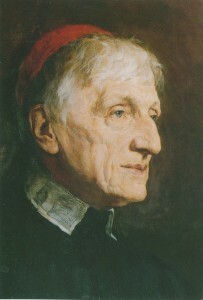 When the gentleman is presented by educators, governing boards and administers as the highest aim of higher education they fall short of Newman’s true end; rooting the human virtues in the theological virtues of faith, hope and love “which adapt man’s faculties for participation in the divine nature.” A proper reading of Newman always insists on the Divine as the first and final motivating force. Newman’s gentleman appears with regularity in his massive literary work but he presents the Christian as one who has been raised by grace to the supernatural practice of faith. Throughout his work the Christian resists the spirit of liberalism, rather than politely avoiding controversy or causing pain:. The eight volumes of Parochial and Plain Sermons collected from Newman’s Anglican homilies consistently present the gentleman as this reference point. The gentleman admired by the world, without obedience or a sense of duty to a living authority is left with the religion of the world; “in every age of Christianity, since it was first preached, there has been what may be called a ‘religion of the world’ which so far imitates the one true religion, as to the deceive the unstable and the unwary.”  Students, parents, educators, administrators and governing boards must all be wary of this counterfeit that replaces a living authority with a superficial religion of the day blocking participation in Divine life. When left to our own devices we fall prey to the orthodoxy of the age where religious pluralism, tolerance and diversity are the highest aims; the only accepted intolerance is against those who stand in faith with orthodoxies found through obedience to the Divine. This is the “gentleman” that the world admires and accepts. Newman, John Henry, The Idea of the University, (Notre Dame, IN: University of Notre Dame Press, 1982), 180-181. Catechism of the Catholic Church, 1992, paragraph 1812. Newman, John Henry, Biglietto Speech, May 12, 1879. Mixed Congregations, “Faith and Private Judgment,” Discourse 10. Newman, John Henry, Parochial and Plain Sermons, “The Religion of the Day,” Volume 1, sermon 24. Newman, John Henry, Oratory Papers, 214. Thank you for this ‘portrait.’ I certainly strive to be such a gentleman, but I am more of a conservative than a liberal. Wonderful ‘portrait’ none the less. In Discourse 8 of The Idea of a University, Newman penned an elegant and attractive description of a refined man of culture. In time the world at large would come to regard this as Newman’s definition of an ideal gentleman. It must be stated at the outset, however, that this assumption is in error due to a misreading of Newman’s text, and in reality does not portray Newman’s “ideal gentleman” – all of which will be discussed further here. Still, this portrait, has praiseworthy elements. Thank you for posting it.